Memory is the critical language and terrain of human rights. Through preserving past evidence of neglect, we make it real, we make it present, and we make it public. The place that bears the mark of the painful past becomes a powerful catalyst for awareness, action, relevance, inspiration, and investment in multiple senses. What happened at Pennhurst and how did caring families and employees finally rise up to end it? How did that change create reform across the globe? What does it mean to be classed as "the other" and how and where is it still happening today? A place of memory at Pennhurst must approach these questions, and lead toward a national dialogue leading toward a more preferred future. At some point many of us will become disabled in some manner, whether from injury or old age. But the events played out at Pennhurst affect all of us in ways that are even more profound. The struggle for acceptance, understanding, and, ultimately, freedom, is central to what it means to be an American. Moreover, it is the dream of oppressed people the world over. Here, at Pennhurst, we have a complex but positive and inspiring story to tell. This place of pain can become place of healing, reconciliation, and insight. It will be a center of national conscience with a message that knows no political, racial, or socio-economic bounds. Please support our cause by donating now. Pennhurst needs to have a memorial or a museum. This haunted attraction is so sickening and disrespectful. It makes me sick to my stomach. I am outraged and disgusted that pennhurst is still now nothing more than a haunted attraction for people to get thrills what those kids went through there is horrifying beyond comprehension! they weren't just abused and neglected they were often experimented on! SICK Basterds! Wow. I am not sure how much I understand about Pennhurst. Please... Quit letting kids use it as Halloween parties., This is a sacred memory of our past. Respect the forgotten. PTSD, Mental disorders, maladies, will refuse to be forgotten. It is more than a haunted house. Leave Pennhurst alone. I find it sick that these buildings are left the way they were the day it closed. Personal possessions, cribs etc. A disgrace. And the fact people visit there as entertainment is vile. Bless it. Tear it down. Then use the vass grounds as a beautiful.park with a memorial. PLEASE TELL ME THAT THE FOLLOWING IS NOT TRUE! I have heard from more than one source that Pennhurst is now the site of Halloween parties where people come to enter and to tour the buildings and to encounter haunts! To my mind, Pennhurst is the Pennsylvania equivalent of the Holocaust! Tear the whole complex down to the ground and leave it as park land. These buildings are so far gone and so full of asbestos it would cost hundreds of billions of dollars. That would be a total waste of time and money better used elsewhere. Adv medicine/training has helped these people escape big institutions that were not financially/staff sustainable. You say reopen them to stop crime/shootings crime is down since the 90s when these places closed! You just don't want to see them out in the world, awful! Glad my cousin is safe @home! This place contains powerful evil and good spirits that need to be left alone! They are being disturbed and should NOT be exploited. I have proof! Please stop people from coming here! They been through enough! 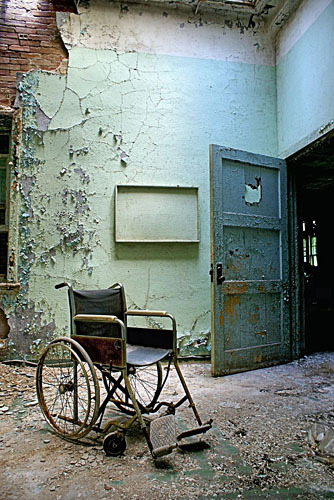 I would happily pay to visit Pennhurst as a walk through museum but never pay as an amusement for Halloween. It's just so disrespectful to the patients who suffered there. It seems like most of the commenters are not even reading the deion closely. 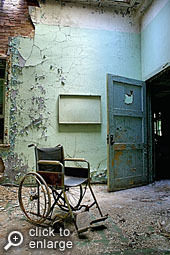 Preservation of Pennhurst does not mean supporting or condoning what the hospital did in its day. It's to REMEMBER the people who lived there as well as the people who worked there. I worked with people who'd lived in Pennhurst-including Nick Romeo. These PEOPLE loved, laughed FELT-like we do. Yes, many weren't easy to love, but that's true for all people. We've come so far need to continue. A museum/place to educate sounds great. NOTHING for Halloween. Show respect.